Keto flu! If you’ve been following a very low carb diet and any of the following sound intimately familiar, there’s a good chance you have the dreaded keto flu. You may be wondering, “What kind of medieval torture is this?” “Why would anyone subject themselves to this willingly?” All of the above are comments seen on the daily in keto forums. Doubleplusungood AF right? If I were a newbie, seeing this would likely make me run for the hills. 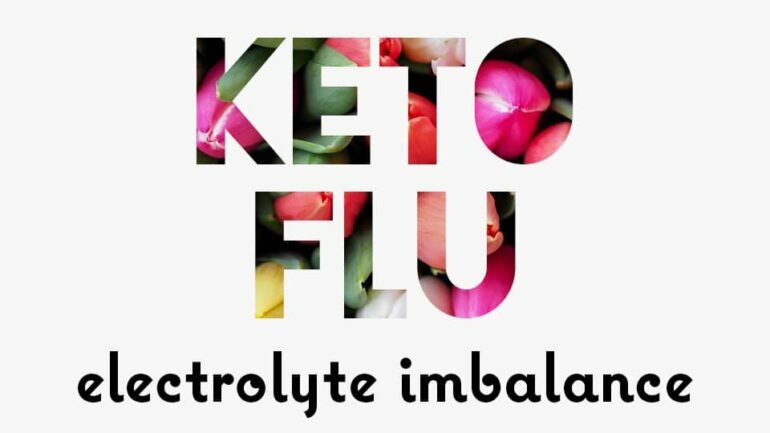 Yes, all these symptoms are normal when you’re experiencing what’s commonly referred to as “keto flu.” However, for the sake of all that’s ACTUALLY flu, I’ll refer to it as what it actually is: electrolyte imbalance. I’m petty like that, #sorrynotsorry. Luckily for you, there is a way to avoid all this yuckiness and lead a cramp-headache-shaky-flutter-brainfog-free keto lifestyle. 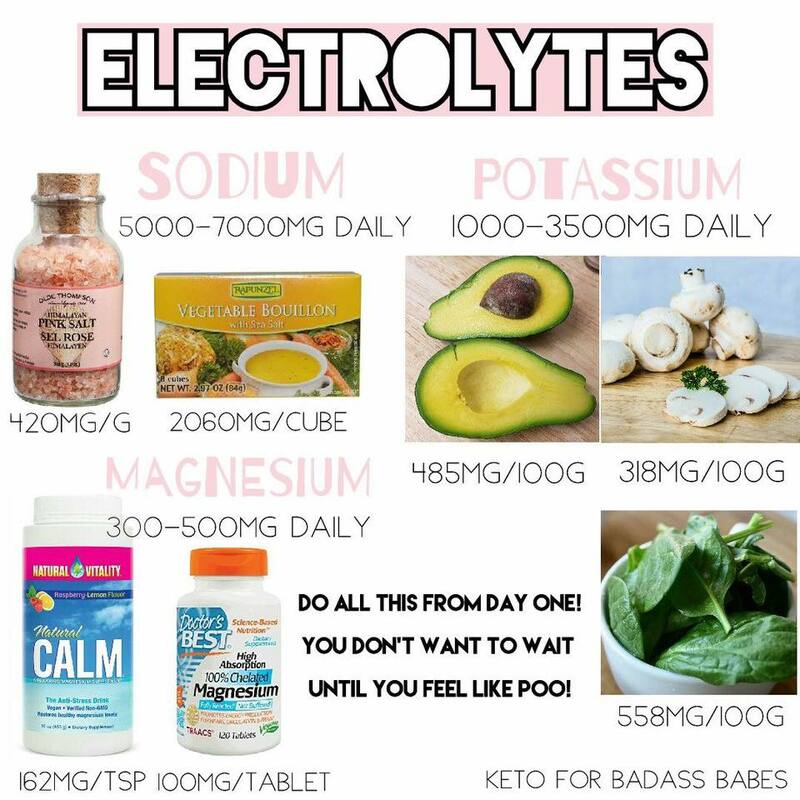 Electrolytes are minerals present in your body, necessary for the proper functioning of your heart, muscles, and nerves and to carry out and regulate a number of processes such as maintaining your blood’s chemistry and muscle action. They are obtained from either food or drink. What happens to electrolytes when you restrict carbohydrates in your diet? 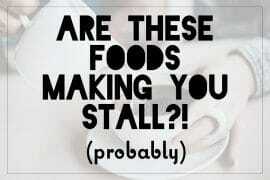 Your kidneys shift from retaining water and sodium to dumping both at a faster rate! Due to homeostasis, our bodies will seek to maintain sodium blood concentration within its normal range, which now will only happen if blood volume shrinks. This shrinkage is what causes all the ugly symptoms: dizziness, brain fog, headaches, bad moods, breaking up with your bf/gf, etc. Other side effects include water retention and constipation (The following video jumps directly to the 7:20 mark for reference https://www.youtube.com/watch?v=5AGiUFzldwk but the whole thing is worth watching). In response to the lower sodium level, your kidneys will also start dumping potassium to maintain an adequate sodium-potassium equilibrium. Shitstorm ahead! Well… not entirely as you’ll probably be super backed up unless you get your sodium on point lol. So, what electrolytes do you want to replenish? Shoot it like it’s tequila! 🙂 Make sure to chase it down with some water tho, dis ain’t no cinnamon challenge (This line was totally inspired by my literary heroine Julia)! Or you can put it in water and add a squirt of lemon juice and ice. OR, if you are a rebel and enjoy your daily dose of #chemicalshitstorm(s) like me, you can put it in your sugar-free beverage of choice. Different salts will have different sodium content, which makes it imperative to READ THE LABEL! You can also check the USDA nutrient database for this info. Kirkland Himalayan Pink Salt has 420mg per 1g. So, to meet 5000mg you will need 5000/420 = 12g. If one quarter (1/4) teaspoon = 1g, then 1 teaspoon = 4g. That means you will need 3tsp, or 1tbs, of this specific salt to meet your daily sodium requirement. Because 12g/4g = 3tsp. Get it? Yay math! Or as I like to call them, soupy breakfast. Dissolve 1-2 bouillon cubes in 1 cup of water. As with salt, the number of cubes you’ll need depends on the amount of sodium there is in the brand you get. 3. What about Powerade Zero and all the other electrolyte replacement drinks? Unfortunately, none of these options have nearly enough sodium to get you through the morning, let alone through the whole day. A bottle of Powerade Zero contains a measly 250mg of and 60mg potassium, which are around 5% of the minimum daily requirement. Spinach: potassium powerhouse with 558mg per 100g. If you’re not eating this every day, are you even keto? Avocados: there’s a whopping 450mg per 100g of these babies. No, avolattes DON’T count you bloody hipster! Meat: most meats contain upwards of 200mg per 100g. Pork loin is the big winner with 423mg per 100g. Get some pork on your fork! (Totes Aussie reference ??). As per Phinney and Volek’s recommendations in The Art and Science of Low Carbohydrate Performance , cooking methods matter. When boiling veg and grilling meat to medium/well done, a measurable amount of the potassium will leach out in the broth and drippings. To make the most of your foods, make sure you don’t throw away any of it by either incorporating it into your meal or, my favourite – licking the plate! Per Phinney & Volek , anyone experiencing low magnesium symptoms such as cramps should be supplementing it, regardless of diet**. It’s also been shown to help with constipation, period cramps, and cravings (this was verified by Yours Truly), so if this is you, keep reading. Please, PRETTY PLEASE, STOP with the #stopdropandchug and #onegallonadaychallenge craziness. Water is not a magic elixir that will heal all your external and/or emotional wounds. Its consumption is 100% necessary, but don’t overdo it, you’re causing more harm than good. Drink to thirst, whether that is four glasses of water or a gallon, but please stop drinking just to meet an arbitrary number. Overdrinking water will only flush out MORE sodium and potassium, leaving you in the same place you started, and in some cases, it can be fatal! Okay, bit #dramaqueen of me, but hey it does happen! Electrolyte imbalance aka keto flu will only be intensified in this situation. Don’t freak out; it’s just an electrolyte imbalance brought on by your change in diet. It is very easy to fix (and prevent!) if you follow the guidelines above. Enough with the unnecessary water chugging. * 5000/400=12.5g –> 12.5/4=3.125 teaspoons. Use a kitchen scale to measure the 12.5g; it’s often easier for measurements than a 3.125 teaspoon household measurement. 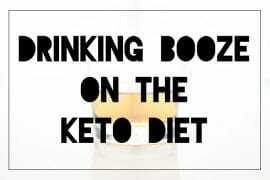 Keto Diet Alcohol Guide: Is Booze Okay if it’s Low Carb? 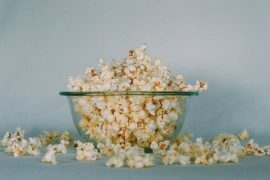 Carbs in Popcorn: Is popcorn keto friendly? 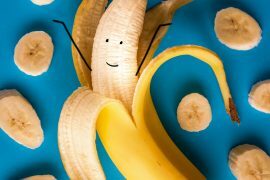 Carbs in Banana – Can you eat banana on a low carb diet? You crack me up! I wish I had had this when I was starting out. I would have done so much better! I hope you’ve got a protein post planned; you are a nutrient goddess! I love this Maria, great job. Hilarious, and good information. Good job Maria. I think everyone once a member should be made to read this and read pinned post to verify they understand. It took me long time to understand. Definitely, we should add it to the free course that everyone goes through. Great suggestion! Yes i wish i had of read this at the beginning. I will follow the suggestions for sure! Thanks for the great reminder information; sometimes we get busy and forget about the basic stuff we need to remember!! Awesome post. Question please… you mentioned about “overdosing” on potassium but did i miss how much we’re suppose to get each day somewhere? I do see the diff food options and how much they have but didn’t see how much I should have. Thank you! Thank you once again for sharing your wisdom. Thanks for the info, I thought I was heading for another dose of the flu (human type). I’ve had these symptoms for most of this week, I only started last Sunday. Could you tell me how long it lasts? Also, regarding keto test strips, does one need these and how long into the diet does one notice urine discoloration. Hey Ray! If the flu-like symptoms you’re experiencing are indeed an electrolyte imbalance, the symptoms disappear really quickly (super fast – like within the hour). If you supplement properly, the symptoms can actually be avoided altogether. Test strips aren’t very reliable; they just measure excess ketones spilling out into the urine. Once your body adapts to using ketones as a fuel source, there typically won’t be an extra in the urine and the strips won’t change color. I would suggest not even using the strips at all… it gives people the “Oh no, I’m not in ketosis!” freak out instead of helping. Unless you have a medical reason for measuring ketones, it’s not really necessary. There’s blood strips and even breath monitors that are more accurate if you need to measure. Hope that helps! Thank you for this post! I was sitting on the couch last night and got the world’s worst leg cramp! I couldn’t massage it away, so I just curled up cursing like a sailor. I’ve been extremely low carb for almost 2 weeks now. It’s getting easier except for the side effects I’ve just started experiencing. I can handle the rest of it, but the leg cramps are killer. I’ll be picking up some magnesium on my way home from work, and incorporating more potassium and sodium into my diet. 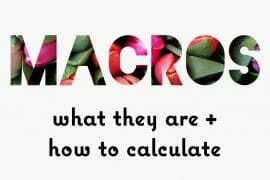 I’m so thankful for great resources – I’m such a newbie! You will feel so much better! It’s a quick fix! Lauren, I was totally suffering with leg cramps. (I’m almost a month into keto diet). I’ve had them in the past, but NOTHING like this! I’d get up a few times a night, hobble to the bathroom (sometimes holding on to the wall) and slather magnesium oil on my feet and calves. Even that stopped working, plus I’d only doze after that, because I was so wary of moving the wrong way, or too suddenly, to really fall to sleep. Horrible. 2 tsp. (divided) of 40,000 Volts liquid electrolytes, 1/4 cube of Rapunzel veggie boullion, a potassium asporotate capsule (99 mg.) and drinking a strict 10 cups of water. I have a slow-release magnesium supplement (Slow-Mag) on the way, and will experiment with alternating Potassium and Magnesium. CALM used to work like a charm, but stopped working for me. So, for now, I am thrilled that I am cramp-free, and sleeping. I haven’t found information yet, on whether this phenomenon evens out on its own, eventually. Hang in there! I wish I read this before starting! I fell off the diet on Day 6 because I woke up feeling horrible and almost passing out! Thank you. The most common reason of why people stop the ketogenic diet is because they start feeling dizzy and get headaches. But that’s only a sign to up the electrolyte intake because the body eliminates more minerals in keto. The benefits of keto are endless, keto flu should not scare people. Thanks for posting this! I had horrible pins & needles in my feet and hands. It was really scary, and felt like a swarm of bees at its worst! Turns out, this was from a potassium deficiency. Once I replenished electrolytes, my body felt normal again! Thanks for your wonderful post! I’ve been eating keto for a few weeks now but I got scared because ny chest was feeling heavy and felt like I was maybe experiencing heart palpitations. Not sure. 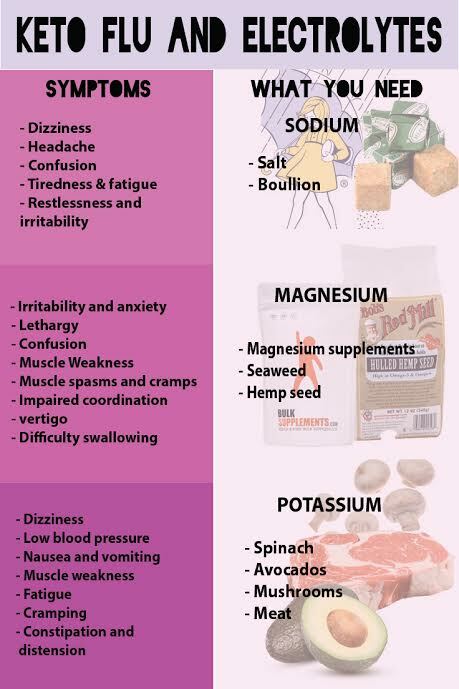 I read if you overdose on magnesium it can cause that type of reaction as well as if you are deficient in magnesium. I also understand that it could have been caused by low potassium but I was eating half an avocado everyday along with huge bowls of salad and bone broth. Great article and thank you for it. Quick question. The amount of recommended sodium – Is that OK for someone like me who takes a pill everyday for high blood pressure? I have spent the last 3 years reducing salt as much as possible because of the high blood pressure. I started Keto about a month ago and have done pretty well, despite having fallen off the band wagon a couple of times. The flu is killing me. Just brutal! My biggest worry is the heart palpitations and the shakes. I feel like I’m a drug junkie going through withdrawals. Thanks for the tips on how to remedy this but my question is when will the symptoms end and must I keep drinking salt and taking all these supplements forever? 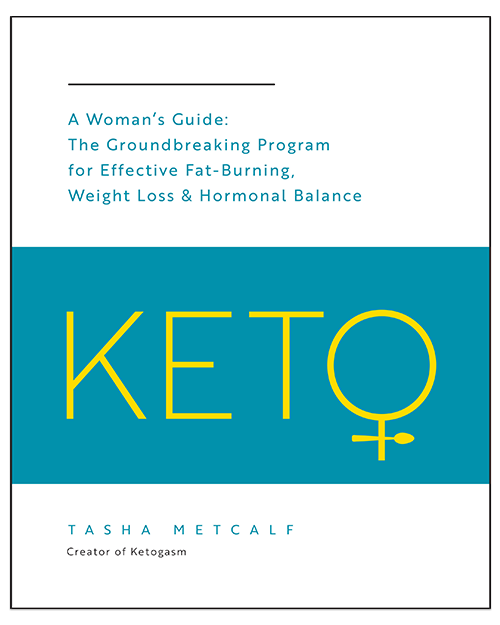 When do we start to feel good on Keto without having to injest all this nonsense? I am vegetarian and already on B12, cholesterol pills and hormone pills (I’m 52 and menopausal.) If I need to add 3 more supplements (magnesium, potassium and sodium) there won’t be much room left in my stomach for food! Just thought you’d like to know, though it sounds like it works fine for you! Doesn’t lyle Mcdonald recomend 5000mg sodium / 1000 potassium on top of the rda? This is a great article but I sure with I could find your sources. Why didn’t you site them…or did I miss them? Phinney and Volek? McDonald? Thanks!!! This is great info – I suspected I had the keto flu 6 weeks in when I got vertigo – scared the crap out of me ( sort of- because I was constipated too). It lasted for a good 2 weeks, along with leg cramps. I drink a LOT of water, so I am taking potassium supplements . But I didn’t know about the magnesium, which I will address today and get supplements. I enjoyed your article. It was written so the average “layperson” could understand it & benefit from it, but is based in true understanding of how our bodies work. Thank you for taking the time to share.